Mold allergy, whose prevalence has significantly increased in the last 20 years, is one of the most common allergy types today. Generally, they are difficult to manage, like most allergies, because they are small and exist in almost 1,000 species. But certain practices can be helpful in alleviating the symptoms of mold allergy. Continue reading to familiarize yourself with mold allergy, the organisms that cause it, and the ways to treat it. Mold is a small fungus floating in the air. It thrives best in warm, moist environments, and its colonies can be found indoors in shower cabins, basements, or carpets, as well as outdoors on tree logs or leaves. The types of mold that most commonly cause allergies include Alternaria, Aspergillus, Cladosporium, and Penicillium. Most women, we breathe in molds every single day without knowing it and with no adverse reactions. However, some women might have an allergic reaction if the air in saturated with molds. This immune response occurs when the body treats a normally harmless substance as a threat. Antihistamines can alleviate allergy symptoms by blocking histamines, which are substances produced by our immune system in response to mold allergens. They are sold over the counter as a tablets, eye drops, and nasal spray. These drugs relieve congestion and swollen nasal passages, which are the common symptoms of mold allergies. They come in tablets, liquid, or nasal spray. Immunotherapy, commonly called allergy shots, focuses on the prevention of mold allergy symptoms. 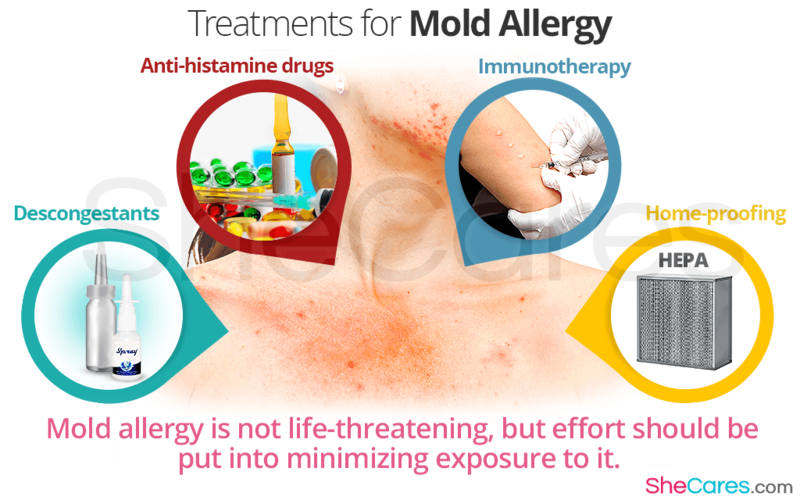 It involves a series of shots containing small doses of mold allergens, so the body gradually becomes immune to mold. HEPA filters (i,e; high efficiency particulate air) are effective in catching mold spores and purifying the air. Washing your hands and changing your clothes when coming from outdoors will get rid of the mold spores. Mold Allergy: Should I Be Worried? Allergic bronchopulmonary aspergillosis. Most commonly affecting women with asthma or cystic fibrosis, this condition can result in a permanent lung damage. Asthma. Women with mold allergy can be more prone to mold-induced asthma, which can be dangerous if a severe asthma attack occurs. Hypersensitivity pneumonitis. At times, mold spores enter the lungs and cause an inflammation. Allergic fungal sinusitis. It is an inflammation of the sinuses due to mold. Regardless of the severity of mold allergy symptoms, efforts should be put into minimizing exposure to it and preventing further complications. Various allergy tests, as well as a thorough medical history and a physical exam, are helpful in diagnosing and managing mold allergies.